Description: Play your cards right with this winning poker hand, a Meyda original pendant design. Handcrafted with meticulous attention to detail, all of the Kings and Queens along with open deck cards have been hand etched and painted. The four Pips associated with the French Playing Card Suits- Clubs, Spades, Diamonds and Hearts-- are each individually represented in their corresponding Reds and Blacks. 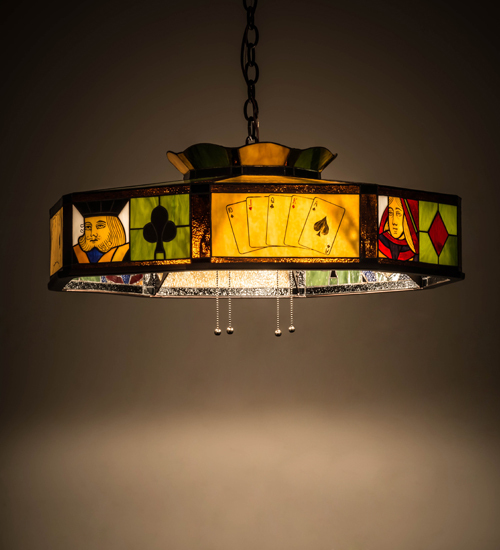 Beige, Green and Root Beer Art Glass are stunning complementary colors to this Poker Face Pendant. The inside framework has been custom crafted with cutout Pips on each arm. The framework, chain and canopy are offered in Mahogany Bronze Finish. This pendant is UL and cUL listed for damp and dry locations.